Cupcakes 'n Daisies: Kabob Skewer Applique . . . . If you would have told me last year that I would not only be making a quilt that was hand appliqued, but enjoying every minute of it, I would not have believed you, but here I am, working on my first hand applique project and absolutely loving it. It all started with this book, Country Inn, by Barb Adams and Alma Allen of Blackbird Designs. Someone who thought I would benefit from a little Blackbird Design exposure sent it to me. I had heard of Blackbird Designs, but really hadn't paid too much attention to their designs because "I wasn't an applique person". This book is nothing but eye candy, and very cleverly written. 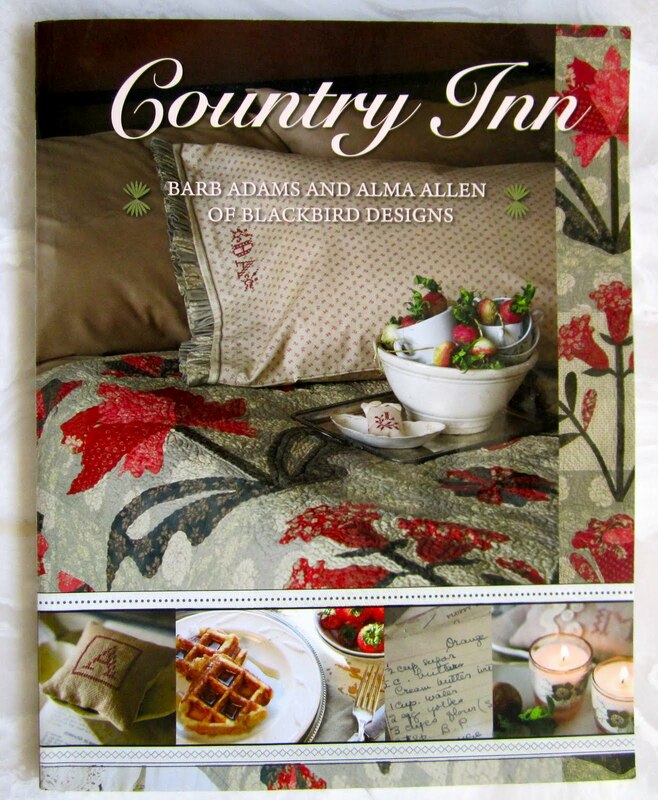 The goal of the book is to "bring the feeling of comfort" into your own home. And this book delivers on its promise by providing amazing recipes, several craft projects, and quilt instructions for 6 quilts. The book was published last year, but if you don't own it, you can still easily get it. One of the craft projects is this adorable pincushion. I made one but forgot to take a picture. It now lives somewhere else. The pattern calls for 1 inch hexagons, but the next time I make one, I'm going with 3/4 inch hexies, I think it would be even cuter if it were smaller. The book also has several pages of instructions for making these sachets. And this is Evening Bloom. 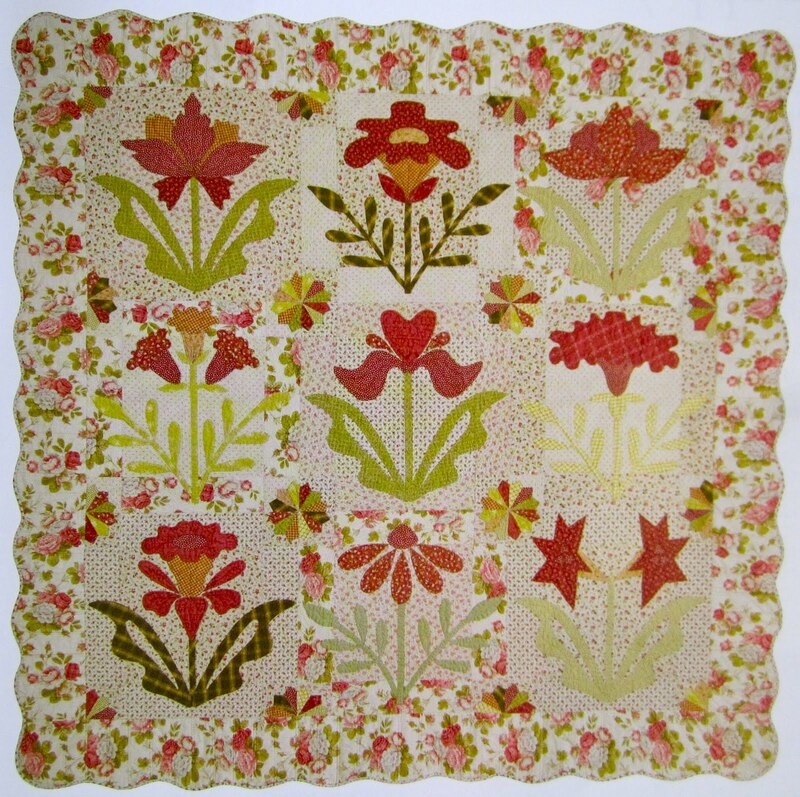 The quilts are very similar, same patterns for the floral blocks, but each quilt has different borders and fabrics. The quilts finish at 80" X 80". The flower blocks are 24 inches each. If you read my blog very often you'll easily know which project called my name, yes Evening Bloom with the reds and French General fabric. It was love at first sight! This quilt called my name so loudly that I could do nothing but find an applique teacher and learn how to applique. So that is how I became an appliquer, some things are just meant to be and happen when they are meant to happen. There are several aspects of appliqueing that I enjoy, it's relaxing, it's something I can do while I watch TV in the evenings with my husband (how appropriate that the quilt is named Evening Bloom, because most of my stitches are done in the evening), and it gave me a reason to finally use this sewing basket. I think I've had this sewing basket for over 20 years. It just sat on a shelf in my office with nothing in it that whole time. 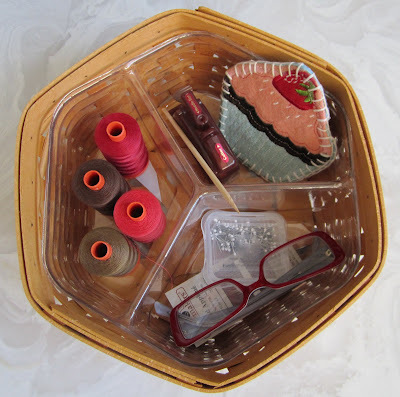 For some reason I just like the idea of having a sewing basket. The method I was taught for appliqueing Evening Bloom was needle turn applique, but I had a little trouble getting the needle to turn the fabric. See that little wooden pointed stick in my basket? That's a kabob skewer from my kitchen. I use it to turn under the fabric, the grain in the wood sort of grabs the fabric and turns it under. I'm guessing as I get more adept at working with the fabric turning process, I'll be able to use my needle as easily as this skewer, but until then, technically, I do Kabob Skewer Applique. Another aspect of applique that I like is that it gives me a reason to use this. . . .
this cute cupcake stores needles! This was a gift from a friend, I loved it before I figured out what it was, but love it even more now that I use it. Monday I'll blog about my first block and actually show a picture of it, stop back by. If you are participating in the Eventide sew along, or Eventide is on your Quilt To Do list, be sure to hop over to Nicole's blog, Sisters Choice Quilts. She's blogging about her fabric selection and how to use light, medium, and dark tones from any family of fabrics to get a great look for Eventide. If you are were struggling with how to get started on this project, I think Nicole will give you some great tips that will get you on your way! I've just completed my first needle turn applique project. It's very primitive. Not sure how much I enjoy it. One of the ladies shared with me that she uses a toothpick for the same reason you use a kabob. I'm going to give that a try next time. I can't wait to see your blocks! I know just what you mean. I took an online hand applique class last summer/fall and was surprised how much I like it. Now I am applique pattern obsessed! I too had thought I only recently became aware of the Blackbird Designs patterns after seeing a few finished projects on blogs. Then I happened to look in my pattern stash for a pattern I had purchased some time ago for a specific project because I liked the design. Lo and behold, turns out it is by BD! Obviously I've loved their designs subliminally for years. I love needle-turn -- well, for me it's Toothpick Turn!! :-D -- applique. I learned from the Piece O' Cake video about a year and a half ago, and got addicted. I'm 3/4'th into the Circuit Rider -- and I have 4 of Blackbird's books and it's just a matter of Time! Love the basket and can't wait to see your block! I'm loving that pin cushion and the needle holder. Of couse the quilt too. Can't wait to see your applique. I love to needle turn, that's the only way I dod it, so it's nice when someone else does it to. I know that your block will be stunning! 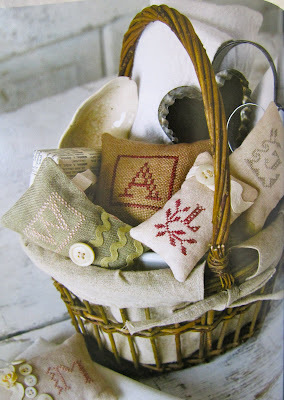 There is something so relaxing about hand stitching... enjoy! I am so impressed that you actually started to applique! I have collected ALL of their books and love each and every project in them... but have I made one? nope. Is there hope? Now that I read your post!!! Hi Thelma! I love Blackbird Designs too. They give you so much for your money's worth in their books. That cupcake is adorable too. Have you checked out my tutorial on Plastic Templates for the hexagons? There are 1/2" hexagons! They are small...the miniature quilters use them a lot. I am sooo wanting to join the QAL I have to show up for Jury selection on Tuesday. If I'm free after Tuesday, than maybe, just maybe, I'll take the plunge and sign up!